from a rally, adventure or endurance perspective. But due to family, jobs and life in general, David is now the sole soul of Raid Designs AB! I am driven by passion and will to let people understand just how wonderful offroading can be and rallies in particular. I want to offer our products at a fair price so that people can afford to pursue their dreams. I always try to find ways to improve on our products and our customers and friends play a big part in development and evolution. If you have ideas on products or improvements, please don't hesitate to contact me! Raid Designs doesn't have big financial muscles so you might have to wait a little longer for delivery. Our logistics department consists of David a roll of packing tape. Period. All products are put together by hand. AND devotion. I'll rather keep the product a day longer to make sure it is just right before I ship it. And I will try to go that extra mile for you. Please tell me if you have another opinion! 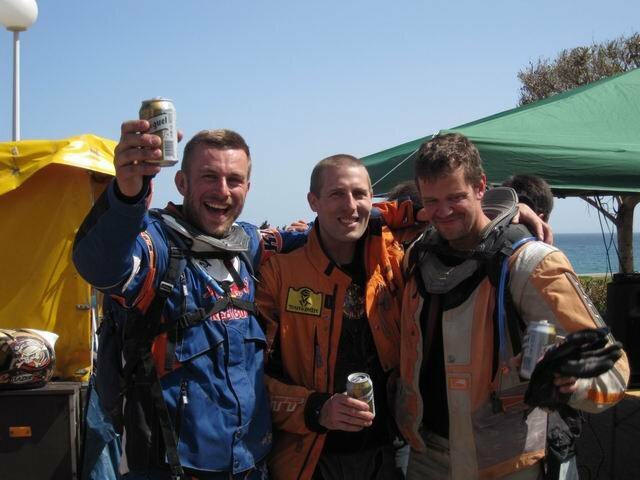 David Petterson, Carl Hagenblad and Klas Adolfsson at the finish of our first rally together, Tuareg Rally of 2010.